I’m currently obsessed with all things striped! While doing some research about the origins of nautical stripes in fashion (for an upcoming blog post), I discovered that I own more striped pieces than any one person should. Some are old, some are new, and all of them are Spring’s answer to “What’s a good staple for the season?”… a question I’m sure everyone is asking, right? Today’s look is 2 parts stripes, 1 part casual, one party querky. Comfort was the goal here… it’s a beautiful beach kinda day and I’m ready to lounge with a cocktail in hand! Stripes on stripes can be tricky, but this look works because both pieces share the same color story of navy and white, and pairing them together creates an unexpected touch of interest that I love! Two notable details from this ensemble: I like the dress super long, to wear with my 4″ high platform espadrilles, but for the flat sandals I needed to shorten it… enter military belt. The belt helps anchor the dress at my waist so I can pull the hemline up a few inches and it stays put. Also, the necklace is actually 3 different chains I found in my jewelry drawer. All three are silver or silver and gold with varying designs, but when linked together they form one unique piece of jewelry. Very rock-n-roll! 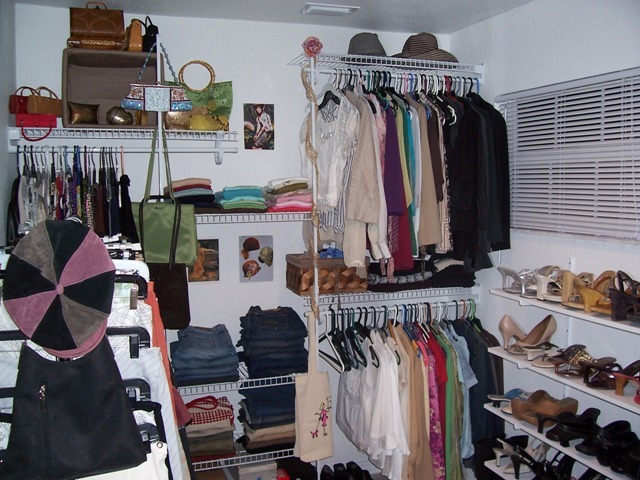 First thing’s first: Let’s shop the closet! After a sit-down with my personal CFO (Mr. Wallet), I’ve decided that it would be a good idea to work with what I’ve already got in my closet before I go out hunting in the Fashion Forest. Mr. Wallet agrees… the hunt can be very dangerous for him after all. I’ll begin by pulling out all of the old styles that I no longer wear. Whether it’s a tired old cardigan from my preppy phase or a pleated floral skirt that now reminds me of a lamp shade, I’ll pull it. Why waste valuable real estate holding on to pieces that I know I’ll never wear again? But what’s this?… an old pair of brown culottes from Express? First of all, what the heck was I thinking? Yes, I wore them once or twice… somehow I rocked the culottes. Paired with tall boots and turtle neck, they weren’t so bad. To toss or not to toss? That is the question. Hmmmm… I’ve got it! Let’s modify the culottes. Genius! So I took them to my tailor and we turned them into shorts! I have spent the last four years playing the part of Mommy to my two little ones. 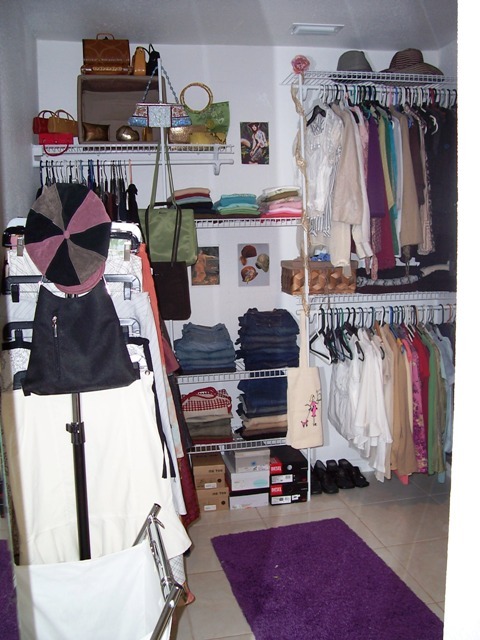 In my pre-Mommy life I had a fabulous wardrobe, filled with designer clothing… the envy of any respectable fashionista. Over the course of those four years I have managed to sell, consign or donate nearly every piece that made me smile. Presently, I am left with mere memories of a life of fashion. My racks and shelves are now less impressed with the cotton tanks and jean shorts that they begrudgingly house. Purging the beauty of that space in favor of the functional has left a hole in my closet, which I now refer to as “the comfy zone”. This is a backhanded compliment of course. I will be venturing back into the fashion industry in a few short months and feel ill-prepared for what lies ahead. I am no longer beaming with pride when I step into what once was considered my “Vault of Style”. These days, I stand in the middle of my closet staring aimlessly at the racks of playground wear and sigh. Well that’s all about to change! I am going on a journey of rediscovery, a quest for higher fashion, if you will. I am going to shop this town like nobody’s done before! … and on a shoestring budget. This is gonna be fun!! I’ll keep you posted on my progress. Wish me luck!